– To keep the sandwich from getting too soggy (a little sogginess is inevitable) I layer the inside of the sandwich box with a paper towel. It also absorbs any of the excess butter and helps curb greasy fingers, though I suppose those are always inevitable too. – Before putting the soup into the insulated container, make sure it’s piping hot. You can also pour boiling water into the container and pour it out before adding the soup. Sort of a preheating kind of method. – Our favorite way to make quick homemade tomato soup is to puree a large can of tomatoes, add a little water or broth to thin it out, add a little Italian seasoning, pinch of sugar, salt and pepper. You can also add a bouillon cube instead of salt. Katie, that’s exactly what my husband said! I ended up making him the same thing. Ha! I”ve said this before, but it bears repeating: I use these ideas for the lunches I’ve started to pack for my husband and me. Thank you! I have to say that one of my favorite things about this series is that the lunches are real and doable. 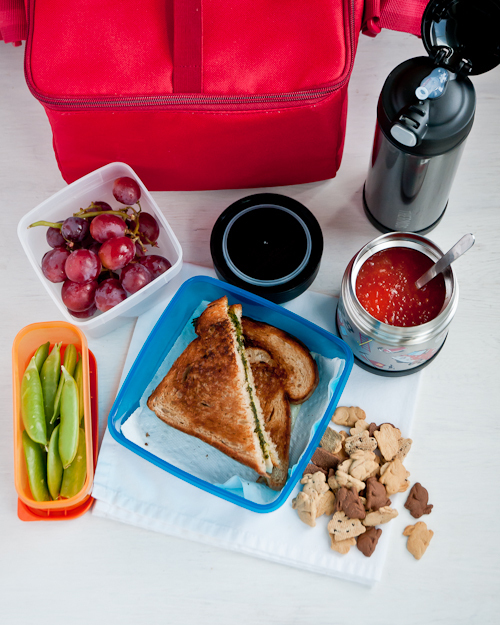 They don’t involve shaping or cutting all of the food into fancy shapes or designs, don’t take an hour to make, and they are lunches that most kids will really eat. Thanks again for putting this together and I’m looking forward to seeing more! try a savory jam…like fig jam in with the cheese. super delish. or berry jam and fresh mozza! Yes! Fig jam is my very favorite. I haven’t thought of doing jam with fresh mozzarella! Brilliant! Yum, love the idea of adding pesto to my grilled cheese! So glad you got the Thermos water bottle, they really are the best you won’t be disappointed!